Apply for your Auto Title Loan or Personal Registration Loan Online NOW! GET THE CASH YOU NEED TODAY! WITH AN AUTO TITLE LOAN OR REGISTRATION PERSONAL LOAN! REFI YOUR EXISTING TITLE LOAN TO A LOWER PAYMENT! With a Car Title Loan you can unlock the equity in your vehicle and borrow money on your Car, Truck, RV, Motorcycle, Commercial Vehicle or ? You can keep your car to drive with a car title loan. We offer auto title loans from $200. to $50,000. * Refinance your existing Interest Only Auto Title Loan to a lower rate. Or to an Installment Loan. If you own a car, truck, van, motorcycle, RV, ATV, Classic Car, Commercial Vehicle - borrow on your equity today! With an Auto Title Loan. Fast, Confidential Private Service for Auto Title Loans. Borrow More Money Pay a Lower Rate with a Car Title Loan. Flexible Title Loan Terms To Meet Your Needs! Pay off the Title Loan anytime with no prepayment penalty or additional charge. Refinance your existing Title Loan. Multiple Locations Statewide To Serve YOU! 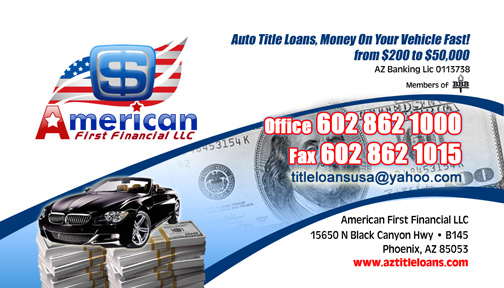 WE OFFER LOANS IN ARIZONA, USING A VEHICLE AS SECURITY. KNOWN AS A "SECONDARY MOTOR VEHICLE FINANCE TRANSACTION". AMERICAN FIRST FINANCIAL, LLC IS LICENSED WITH THE ARIZONA STATE BANKING DEPARTMENT. LICENSE # 0904168. ALL LOANS ARE MADE IN ACCORDANCE WITH STATE AND FEDERAL LAW. WE ONLY OFFER THESE LOANS IN THE STATE OF ARIZONA. THIS OR ANY OFFER IS UNAVAILABLE OUTSIDE OF THE STATE OF ARIZONA.